In December of 2017, 2,778 farmers in Inhambane province, in southern Mozambique, planted the CIP-bred sweetpotato variety Alisha, which had been released the year before. 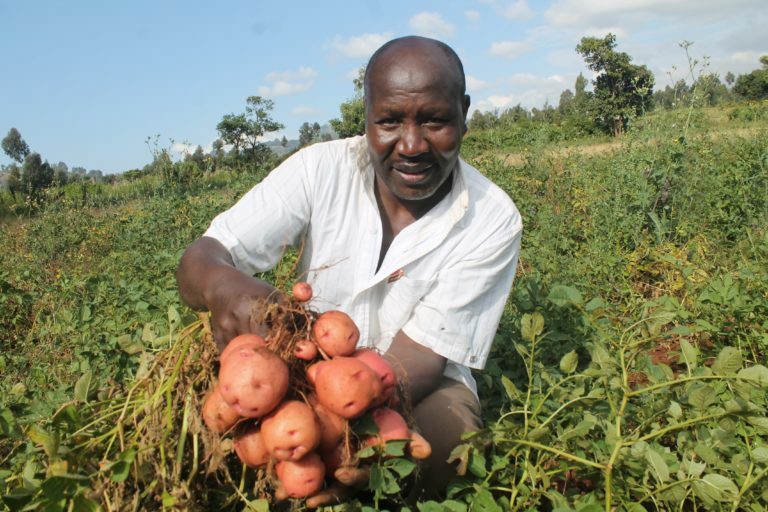 It was a significant increase from the 500 farmers who planted that variety in 2016, indicating that nutritious and resilient Alisha has good potential for contributing to efforts to reduce hunger and malnutrition with orange fleshed sweetpotato (OFSP). According to CIP sweetpotato breeder and 2016 World Food Prize Laureate Maria Andrade, Alisha is comparable to Irene, Mozambique’s most popular OFSP, which was one of 15 CIP-bred varieties released nationally in 2011. Maria has been promoting the cultivation and consumption of sweetpotato in Mozambique for more than two decades, and the OFSP varieties that she and her colleagues have developed now constitute one third of the sweetpotato grown there. 2,778 farmers in Inhambane, Mozambique, planted the OFSP variety Alisha in 2017. Farmers in Inhambane harvest Irene, Mozambique’s most popular OFSP variety. Irene is especially popular because its narrow leaves can be eaten as a vegetable 60 days after planting, and its delicious orange-fleshed roots are ready to harvest after 100 days. Like all the varieties that Maria has developed, Irene is drought tolerant, a vital trait in a country where extreme weather events frequently destroy crops. Maria and three other scientists were awarded the World Food Prize in 2016 for their promotion of OFSP to combat vitamin A deficiency, which causes a host of health problems in sub-Saharan Africa, but she notes that the varieties she develops also contribute to food security and disaster recovery. “I have visited farms during droughts when the maize crop had collapsed but Irene was growing well,” Maria said. Irene and Alisha are just two of the 22 sweetpotato varieties that Andrade has developed over the past decade – 19 of which are OFSP, with high pro-vitamin A content, and three of which are purple-fleshed varieties with high levels of antioxidants. Under the Sweetpotato Action for Security and Health in Africa (SASHA) project, Maria and her team are currently evaluating a new group of sweetpotato clones – purple fleshed and OFSP – five or six of which should be released as new varieties in 2019. The regular release of improved sweetpotato varieties in Mozambique is the result of an accelerated breeding scheme that cut the time it takes to develop and release a new variety from eight years to four. It involves simultaneous field assessments in three or four different environments, which allows scientists to identify viable candidates more quickly. “Being able to refresh the system every four years with more productive and nutritious varieties is wonderful for farmers,” Maria said. And Mozambican farmers aren’t the only beneficiaries, since Irene is also being grown in Burkina Faso, Ivory Coast and Kenya. Maria’s breeding work is thus improving lives across the continent.